Someone at codeforseattle made this visualization of the cuts that Metro proposes. Black dots represent eliminated stops; red stops will experience longer waits, and green dots will actually have shorter waits thanks to route consolidation. Given the parks on this map, green was not a good choice, but it’s still a powerful expression of the stakes this year. Not a very good visualization. Unless the rerouted 50 is going to make no stops on 35th Ave SW, there’s no reason why all those black dots representing eliminated stops should be there. Yeah. 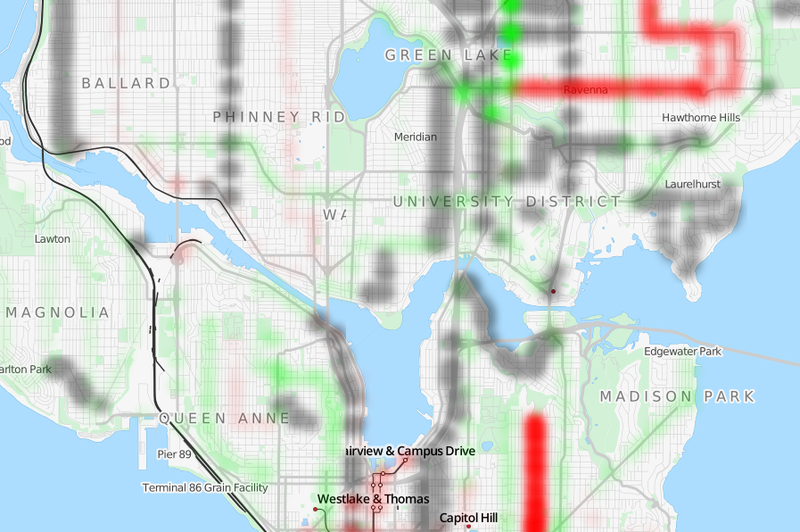 Same thing along route 28 in Ballard; much of it would be replaced by the restructured 28X. Probably different routes using the same stops. Also, how are there overlapping black and red dots? The stop is being eliminated AND you’ll be waiting longer for a bus? Replied to the wrong one. Sorry, y’all. Without route numbers on the map, that’s a very confusing way to display that. Either a stop is being eliminated or it isn’t. Using two colors for the same stop doesn’t convey any useful information. That map shows the north of Market portion of the 28 eliminated. I thought the proposal was to consolidate the 28 w/ the 28X and make it an all day route? Or did they just see the 28 as deleted and not check the 28X? Seems to be incorrect, e.g. it removed all the stops along 8th ave NW, while 28x is still going to be there, 28 will be gone. Easy and fast way to save money though, would be, to raise cash fares by 75c-$1 and let orca costs remain same or proposed +25c. Sometimes I see that it takes additional minute on busy stops for people to jingle their cash. – Service on 19th Ave is not being reduced – it’s being eliminated. – Service on 8th Ave NW is not being eliminated – it’s being reduced. – Service on Union St is not unchanged – it’s significantly improving. – Service on Queen Anne Ave is not unchaged – it’s being doubled. Likewise for service to SPU. – Service on Galer St is not slightly worse – it’s virtually eliminated. This is just what I found in the first 30 seconds. I’m sure there’s more. Wrong. Failure to plan ahead and unrealistic budgets created the funding gap. Politicians blame the recession they helped create for everything under the Sun. The recession did not create government incompetence. Career politicians with spending addictions created the funding gap. I shared this on the HackPad on Saturday. But I’m pretty sure it’s a data source issue with how the data is presented. It shows routes like the 73 as running much more often (http://metro.kingcounty.gov/am/future/PDFs/changes/route-073.pdf) but doesn’t do it on a stop by stop basis. So unless you know that the stops north of Northgate won’t exist at all for the 73 (which I think is only in the picture) it’s hard to show it accurately. Basically they’re consolidating a bunch of routes into one. But running that one route more often. These cuts seem wise to me. It’s time to consolidate resources, eliminate duplicative services, and encourage other forms of transport; i.e. carpooling, bicycling, walking, and taxis. We can’t afford the existing system, and none of us want to pay additional taxes. It’s time to do with what we have, and make the best situation with current resources. Fewer transit lines could free up roads from idling and waiting buses, allowing private vehicles to move more rapidly. Coupled with a pro- bicycle, taxi, and walking system – Seattle will do fine. Remember we are not a world class city, and many of us want to keep Seattle the quaint small town that we love. Turning a busload of commuters into 60 SOVs will do wonders for traffic! Cutting 17% of service to get rid of the 1-2% of service that is duplicative is, um, an intriguing proposal. We need to do a better job with the empty buses though. Since that generally correlates to the bus laying over out of service, there should be no harm in dematerializing the bus for 10 minutes, and rematerializing it 10 minutes later. Those who revolt against the bus system and go back to driving will run into a trap set up by the gubmint: gas tax. Resistance is futile. Of course, nobody is riding the bus any more. It’s too crowded! I’m voting no to the tax, and so are most of the people I know. I don’t want my money going into some black hole, aka Metro.